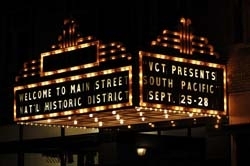 The Viroqua Community Theatre was established in 2007, as a way to provide an opportunity for dramatic expression in theater, education and performance - creating one community through the arts. Viroqua Community Theatre is a 501(c)(3) non-profit organization. One of the benefits of a strong cultural presence is that it inspires creativity and offers opportunity for expression to our community. It unites us and provides an opportunity for healthy social relationships to build. Art enhances the economics of our region and makes for improved relationships both socially, and in the business world.